I took a sabbatical from exercise. And then I ate chocolate like there was a prohibition on chocolate. I ate, drank, and oh I was merry…for a little while anyway. I not only fell off the wagon, but I hacked it up into kindling, started a bonfire and made smores by it. Here’s what I do know, my body was pissed right off that I took a break. And I explained to it that “we were on a break”, but it didn’t seem to matter because it fought back like a cat stuffed in a boot (weird reference, but sadly I’ve actually saw my Dad stuff a cat into a boot. Don’t judge, it bounced out and lived for another 20 years). My joints seized up; if I sat too long I had to shuffle for a bit after standing just to get going. My skin broke out…it’s not fun having the skin of a 13-year-old boy let me tell you. I was sad for no clear reason and I wanted to punch things. Often. I was hungry more often even though I was eating foods that were richer in fat content and calories. For the first time in years, I wanted to binge on potato chips. The kind of binge where you suddenly awake as if in a trance-like-state surrounded by potato-chip crumbs. I was sick more often within two months than I had been in years. Doesn’t that sound fun?! So the other day I decided I was going to go back to eating healthy foods and get off my ever-expanding tush and go for a run. I loaded up my iPod with a Power playlist that makes it impossible to sit still while listening (or at least will have you shoulder dancing). The 5K that I could once run in 30 minutes, took me 41 minutes. It was like starting from scratch. My legs felt like I had small children attached to each one and I drug them the entire way. Pretend I am getting chased by hissing geese (which has happened to me before). That got me through one KM. Pretend someone is running beside me critiquing me on my running style (steady breathing, abs in, look straight ahead). A judgemental Gazelle was running along side me (at first I spelled it “Giselle” but I mean the animal, not the hot super model). Remember that movie “Speed” with Sandra Bullock where the bus would blow up if it quit moving? I am the bus. Don’t stop or I will undoubtably blow up. Wear a tank top from “Ruffles with Love” found on ETSY that reads “Shut Up and Run”. 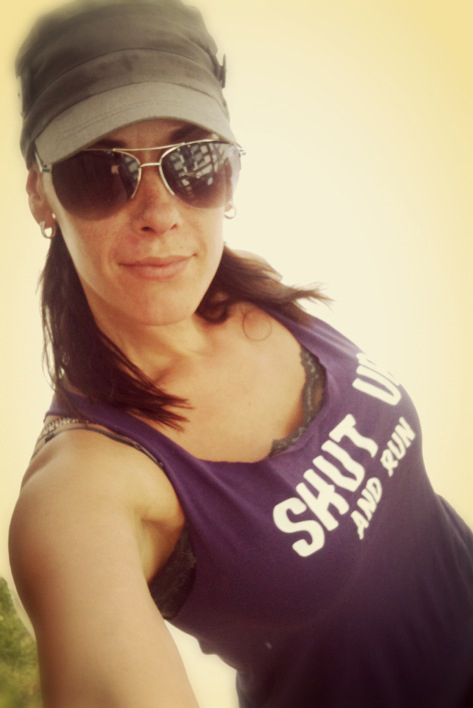 I don’t want to be an oxymoron…that chick along the running trail who’s stopped, doubled over, dry heaving while gripping her aching muscles sportin’ a “shut up and run” tank top. It will in fact force you to shut up and run. I can rest when I’m done. I’m pleased to report that I did finish my 5K and I’m back on my healthy eating/exercise program. Remind me to never check out again, that wasn’t fun in the long run. P.S. I have yet to weigh myself, but the muffin top that spills over my jeans tells me I have some work to do. Ok body, we are no longer “on a break”.